TIGERLIM.COM: How To Make A Outdoor Fresh Sashimi Meal? Just to share a little idea to you all Bruthers here how to have or make a outdoor sashimi meal! Normally if you talk about outdoor meal is like BBQ, Curry, Mee Goreng like that at the beach or picnic lah. You'll never think of japanese foods like Sashimi makan at the beach coz in you mind that this is not gonna be fresh and cepat rosak one coz Sashimi must be very fresh if not nanti sakit parut tu! 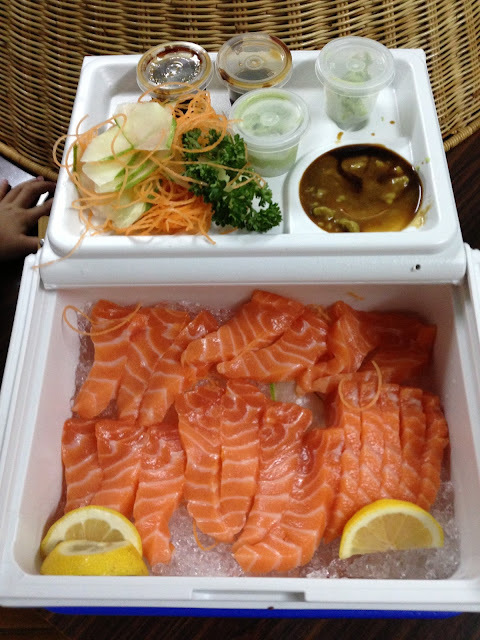 Here just to teach you a little way how to bring your favorite sashimi salmon eat at outdoor! Very simple as ABC, Just need to use a small size cool box like 6 cans cola one enough sudah! I like to use the coleman one coz can flip other side can close type! 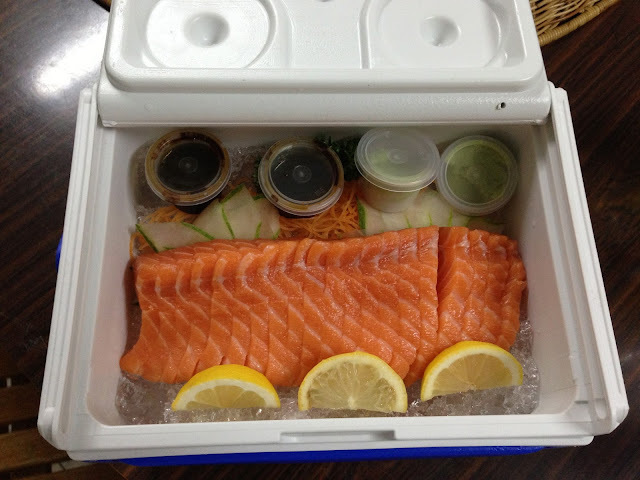 Just bring it to your favorite japanese restaurant and ask them to cut the sashimi and put in the cool box and make sure the box is fill up the ice cube at bottle then the ice crush on the top. Ice must over half of the box then baru lah do the deco for the sashimi!!! Then like this your sashimi can hold fresh for few hours already!! 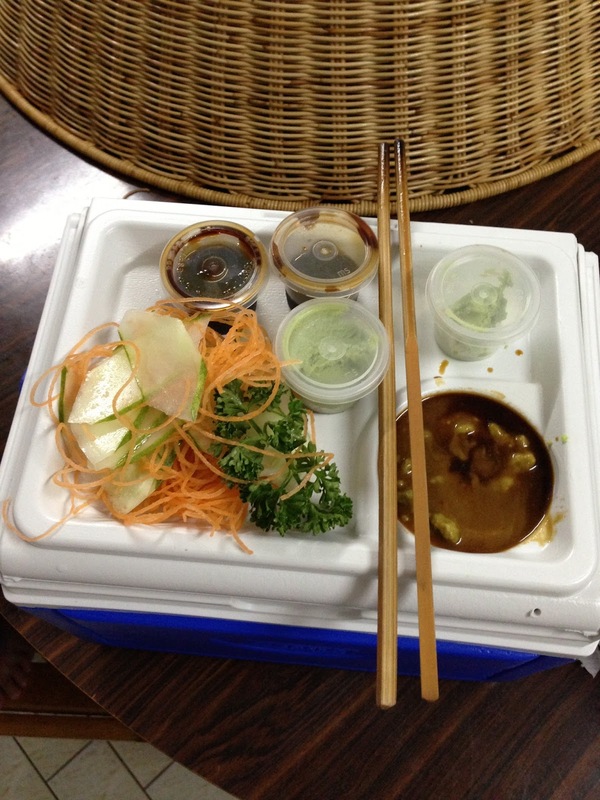 Not need to bring plate just ask for chopstick saja! The soya sauce and wasabi just pour and the cover saja... once you want to close just slide it can close it can keep it cool and prevent flies attack!!! Even got flies I also no takut coz I have my Bug-A-Salt. So try it next time you want to have sashimi outdoor!!! I just went to Kaisen and ask the chef to do for me!!! Like that only B$21.00 saja!! Then the soya sauce and wasabi just put on the cover saja and then I let all the salmon sleep on the ice and let them all cold cold before eat! I found do like that is much more yummy! If no makan just slide and close so the salmon can tahan lama! Flies cannot cannot eat... unless they also like the wasabi lah! !